While carrying over many of the practices of his previous record, Tim Hecker shifts his perspective away from the dreamscapes of Love Streams and explores a darker spiritual realm on Konoyo. 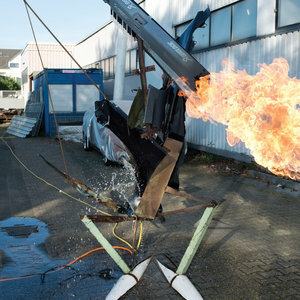 Record by record, Tim Hecker has solidified his position as one of the most important experimental, electronic music producers of this generation. His initial ambient vision, reinforced with glitch elements, was displayed in his debut record Haunt Me, Haunt Me Do It Again, but it has always been adapting to new ideas and notions. Harmony in Ultraviolet saw Hecker tackle the drone dimension of experimental music, a theme that carried on in his monumental record Ravedeath, 1972 and the equally impressive Virgins. In 2016, Hecker made a bold switch with his 4AD debut, Love Streams. While still retaining his experimental electronic outlook, he started to investigate new elements. Working with the late great Johann Johannsson, Hecker made choral vocals the centerpiece of his work. In reconfiguring these samples and re-arranging them to create an uncanny progression, he displayed a different quality of his music. All of Hecker's works have carried a certain emotive element, but the range of sounds in Love Streams exploded, turning the producers usual dim sonic structures into brilliant dreamscapes, ranging from infrared to ultraviolet textures. This switch appears to have been both important and necessary for Hecker, and his new album Konoyo, even though it diverges in many ways from Love Streams, also carries some of the previous record's practices. In the same way, as with Love Streams, Hecker works in big part with recorded samples, but instead of the Icelandic choral music, Hecker shifts his focus to the Far East. For Konoyo, translating roughly from Japanese to "the world is over", Hecker traveled to Japan, where he recorded the record over various trips. To aid him in this process, he collaborated with a gagaku (a form of Japanese classical music) ensemble in a temple on the outskirts of Tokyo. Aided by this plethora of instruments, Hecker was inspired for Konoyo by conversations he had with a recently deceased friend about the concepts of negative space and music's increasingly banal density. A difficult subject certainly, and one that has added to the tension that this record delivers. The opening moments of Konoyo see this quality come to the surface as the slow-moving strings of "This Life" build up the dissonance that defines this work. "Keyed Out" is another instance when this excruciating tension stretches the soundscapes, as dissonant samples and reconfigured synths come to complete this grand design. The sonic landscapes of Hecker in these instances appear completely hostile and unapproachable, but still, he is brilliantly able to warp the textures into something more soothing. The introduction of percussion in "Keyed Out" also plays a big part in that respect, as it introduces a sense of timing to this work. But, at the same time Hecker builds this continuous tension, he lays down some fantastic synth melodies, creating a contradiction between the dissonance and the dreamy quality that define his works. "In Death Valley" sees this sonic modification awaken one of the most soothing characteristics of the producer, as the circular motifs are altered through the use of subtle noise, while the harsher elements come under some additional modification. The latter part of "This Life" is another example of this approach, with the drones taking over and creating a majestic environment. It is also a quality that can produce not only grandiose moments but more minimalistic tendencies, as is the case with the shortest track of the record "Is a Rose Petal of the Dying Crimson Light". By exploring these less harsh territories, there are times when Hecker allows the dream quality of his music to take over completely. "In Mother Earth Phase", the producer delivers a mesmerizing recital that relies primarily on the mellow aspect of the drones. Despite certain dissonant elements, the track covers a more emotive ground, with the expressive strings aiding in that regard. That allows a cinematic quality to come to the front, filling your mind with dreamy landscapes and surreal imagery, resembling a Tarkovsky film. This aura is further explored in "A Sodium Codec Haze", as the sweeping drones intertwine with percussive samples to create a sweet haze of sonic artifacts and build the hypnotic quality of the track. The closing track, "Across to Anoyo" is the pivotal moment of the record, which sees Hecker put all the aspects that he explored in Konoyo under the same roof. The subtle exploration, the impressive sound design, the tension, and the cinematic quality all find their way into the track, while Hecker takes his experimentalism a step further, pushing the audio effects more and reshaping the samples in a more abrupt fashion. Comparing Konoyo to Love Streams, it appears that both records have a common point of origin, but then quickly diverge to opposing territories. Where Love Streams was a canvas of infinite colors, Konoyo feels like the absence of color, something of a negative space. This does not suggest that the album does not feature polymorphic elements, or that it is not as exploratory. On the contrary, Hecker is bolder with Konoyo, but the themes he explores in that negative space are darker and more oppressive, presenting the missing link between Virgins and Love Streams. And that is what Konoyo showcases: the ability of Hecker to once more reinterpret himself.